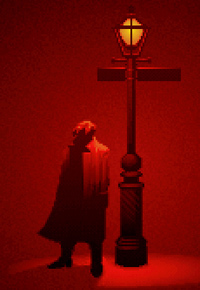 In the third Gabriel Knight game, Blood of the Sacred, Blood of the Damned, five years have passed since Gabriel’s last Schattenjäger case. Gabriel and Grace are called to Paris by Prince James Stuart of Albany. He wants them to watch and protect his little son Charlie from the “night visitors”, a curse which for centuries has caused members of the Stuart family to wake up weak and pale as if blood had been drained from their veins. What initially appears to be a case of vampirism turns into something bigger when the baby is kidnapped. Gabriel chases the “night visitors” and manages to jump on their same train, but loses their track in Languedoc not far from the small village of Rennes-le-Château. This time Gabriel and Grace’s investigations are not easy at all: Rennes-le-Château is famous for its unsolved mystery involving the Visigoths, the Cathars and Knights Templar. A group of treasure-hunters attending an organised tour is eager to solve the mystery and find the source of the legendary wealth Abbe Bérenger Saunière had found a hundred years before, which is said to be still hidden somewhere in the area. In addition, many picturesque individuals inhabit the valley. Which of these – if any – is the kidnapper? Spoiler The Schattenjäger will have to ask many questions. What actually are the interests of the Priory of Sion, the organisation to which the local Abbe belongs? Is the bloodline of Christ really the secret for which everyone is hunting? And just who is Emilio Baza, the silent man with no fingerprints, who is strikingly reminiscent of the legendary Wandering Jew? There is another final question that Gabriel will have to face. What are his exact feelings towards Grace? Is a night of passion the token of true love? This time, Gabriel arrives back too late. The mystery is solved, but his loving and now loved Grace is gone.